Architecture shapes a city, as the saying goes, but it’s money that shapes architecture. Barcelona’s astounding array of late 19th structures can be attributed to an economic boom, along with a time when the god of good buildings smiled on the city as it gave birth to Gaudí, and other visionaries who make up the artistic and cultural movement known as modernisme. Most of their work is located in the vast neighbourhood of the Eixample (or extension) – a work of art in itself and perhaps the most modern of them all.By the mid-19th century, Barcelona’s old town, which was still partially walled, was literally bursting at the seams. The working classes were living in mostly dark, airless slums, whilst the bourgeoisie, who were getting richer from the important textile industry and trading with the Americas, were living graciously in villas in the outlying villages, such as Pedralbles and Sarria. In between was a vast swathe of land that the authorities chose to develop, not only to alleviate overcrowding in the old city but also to connect it with these satellite communities.Idelfons Cerdá, a civil engineer with socialist ideals was chosen for the job. Cerdá undertook an extensive study of the housing conditions of the old city, before embarking on his design for the new. 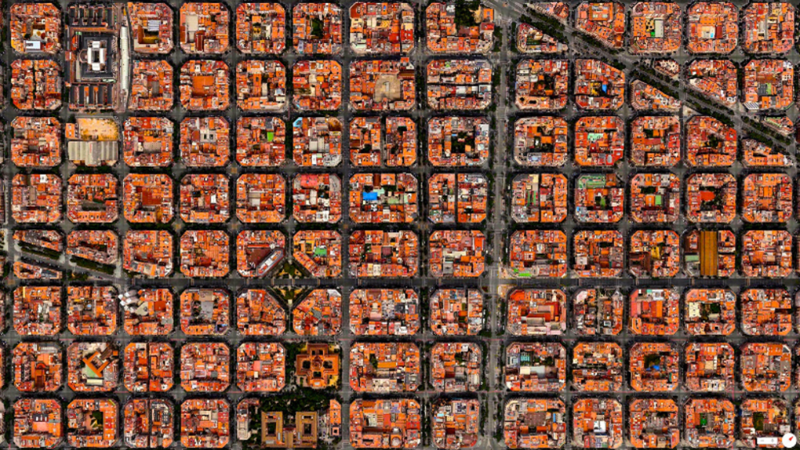 The resulting work, the Statistical Monograph on the Working Class of Barcelona, revealed their squalid living conditions. For Cerdá, the Eixample project would revolutionise urban living, by providing light-filled apartments on wide streets and boulevards, interior courtyards for communal gatherings, a market and park in each sub-section and chamfered corners to facilitate traffic (back then horse and cart) flow.As the vacant land of the Eixample was filled with Cerdá’s strictly ordered matrix of streets, so were the coffers of the ruling classes. They wanted this spanking new area for themselves, particularly the prime streets on and around the Passeig de Gràcia, the Eixample’s main boulevard and now the poshest shopping strip in Spain. Enter architects Gaudí, Puíg i Cadafalch, Domenech i Montaner and many others, who, together with an army of talented builders and craftsmen, were only happy to design showhomes for the city’s elite – fanciful palaces rich in detail that often symbolised the owner’s heritage and social standing. This resulted in showstoppers such as the Casa Batlló, Casa Fuster and Casa Amatller.Today, the Eixample still has somewhat haughty airs to it. Over the decades, some of the block’s community gardens have been reclaimed for residents use, though lack of ‘green space’ and incessant traffic remains its drawback, albeit compensated for by living in one of the most attractive and architecturally coherent neighbourhoods in Europe.Barcelona’s local authorities once again have turned their attention to this part of the city. There are plans underfoot to ‘humanise’ the Eixample. The main issue is that in its uniform matrix all streets are the same; in width and traffic speed. The idea is to cut it up into ‘superblocks’, delegate some as ‘main streets’ with a limit of 50kmph for through traffic, whilst others would be pedestrianized or give a speed limit of 10. Buses would only be able to circulate on the main streets and more bike lanes will be installed. More public space would be gained by reducing traffic flow for small parks and squares, making it more in tune with Cerdá’s utopian ambitions.